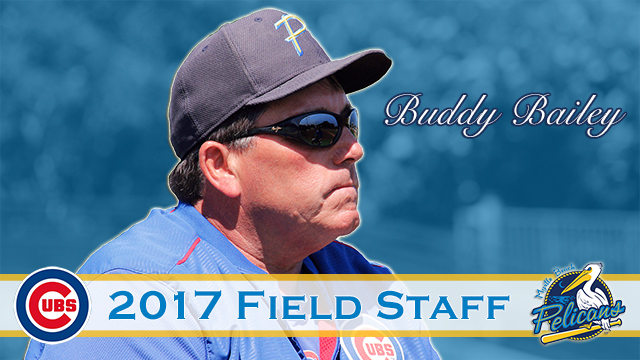 MYRTLE BEACH, S.C. (December 16, 2016) - In conjunction with the Chicago Cubs, the Myrtle Beach Pelicans have announced their on-field staff for the 2017 season. After steering the club to their second consecutive championship last year, Buddy Bailey will return as the Pelicans' manager. Myrtle Beach's staff will also feature championship holdovers Anderson Tavarez (pitching coach), Toby Williams (athletic trainer) and Jason Morriss (strength coach). Guillermo Martinez will take over as the club's hitting coach while Ty Wright will serve as the Birds' assistant coach. Bailey, 59, piloted Myrtle Beach in 2016 to an 82-57 (.590) overall record and the Pelicans' fourth Mills Cup Championship. Myrtle Beach's Carolina League title marked the second in as many years, making the Pelicans the first team in the circuit to repeat as champions since the Winston-Salem Spirits, also a Cubs affiliate, did so in 1985-86. It was also the second championship of Bailey career. He also guided the 2011 Daytona Cubs to the Florida State League Championship. A member of the Cubs organization since 2006, the 2017 campaign will be Bailey's 29th season as a manager and 12th with the organization. During the 2016 season, Bailey surpassed 1,900 wins in his career. His overall 1,930-1,773 (.521) record, which dates back to the 1983 Pulaski Braves, places him 15th all-time among minor league skippers in wins. Over his tenure with the Cubs, Bailey has managed in Class A-Advanced Daytona (2006, 2009-11), Double-A Tennessee (2008, 2012-15), Triple-A Iowa (2008) and Myrtle Beach. The Madison Heights, Va. native is currently in the midst of his third stint in the Carolina League. A 16th-round pick by Atlanta out of Lynchburg College in 1979, Bailey spent four seasons as a catcher and first baseman in the Braves' system. Bailey also played part of the 1982 season with the Durham Bulls, then of the Carolina League. He later managed the Lynchburg Red Sox during the 1991 and 1992 seasons, going a combined 144-130 (.526). During his time in the Boston organization, Bailey also earned the 1996 and 2003 International League Manager of the Year awards while with Triple-A Pawtucket. Tavarez also returns for his second year on the Grand Strand. The Santiago, Dominican Republic native helped tutor Myrtle Beach's pitching staff, which included Carolina League Pitcher of the Year Trevor Clifton, to several circuit-leading categories including ERA (3.47), runs (545), earned runs (473), home runs (65), walks (411), WHIP (1.29), holds (45) and saves (48). The Pelicans also finished tied for first in shutouts (14) and were second in hits allowed (1,176). Now in his 17th season as either a player or coach in the Cubs' organization, Tavarez pitched in the system from 2000-05 before working as a pitching coach with the DSL Cubs from 2007-12, rookie-level Mesa Cubs in 2013-14 and Short Season Class A Eugene in 2015. During his one season with the Emeralds, the club posted the Northwest League's most strikeouts (691) and came in second in ERA (3.55). Martinez enters his fourth season as a coach in Chicago's organization and his first as Myrtle Beach's hitting coach. The Miami, Fla. native spent the 2016 campaign with Low-A South Bend, where he helped the Cubs finish among the top three clubs in the 16-team Midwest League in average (.266), on-base percentage (.333), slugging percentage (.374), OPS (.708) and runs (633). Martinez began his tenure with the Cubs as an assistant coach with Short Season Class A Boise in 2014 and Tennessee in 2015. He served as the interim hitting coach with the Northwest League champion Vancouver Canadians (Toronto Blue Jays) in 2013. Born in Managua, Nicaragua, Martinez was originally drafted out of Coral Park High School in Miami in the 17th round of the 2003 draft by the Chicago White Sox, but he did not sign. After attending the University of South Alabama, the Florida Marlins selected him in the 15th round of the 2006 draft. Martinez reached as high as Class A-Advanced in three seasons in the Marlins' organization, posting a .214 average and one home run in 147 games. He went on to play independent ball from 2009-11 with the Windy City ThunderBolts, Lake County Fielders and Grand Prairie AirHogs, batting a combined .294/.363/.387 with five homers and 86 RBIs in 250 contests. Wright heads to Myrtle Beach after serving as an assistant coach with Eugene last season and Mesa in 2015. The 2017 campaign will mark his 10th as either a player or coach in Chicago's organization. Originally drafted by the Cubs in the seventh round of the 2007 draft out of Oklahoma State University, Wright enjoyed a seven-year playing career in Chicago's system, reaching as high as Triple-A Iowa. He batted .292/.352/.429 with 60 home runs and 381 RBIs in 724 games from 2007-2013 before playing with the independent Somerset Patriots of the Atlantic League in 2014, when he hit .265/.328/.399 with 13 homers and 64 RBIs in 112 contests. The 2016 Carolina League Trainer of the Year, Williams begins his fourth year as a trainer in the Cubs' organization and his second with Myrtle Beach. Born in Thailand, Williams spent a year 2013 with the GCL Braves after serving as a graduate assistant at Auburn for three years. He earned his B.S. in athletic training from Samford University (Ala.), and his MEd from Auburn. Morriss enters his fifth season with the Cubs and third with the Pelicans after serving in the same role with Daytona from 2013-14. Born in Brisbane, Australia, Morriss has also spent time with the Houston Astros and Cincinnati Reds. The Mesa, Ariz. native earned both his bachelor's and master's degrees from Angelo State in San Angelo, Texas. Mariano Duncan will be the co-hitting coach with Triple-A Iowa after serving in the same role with the Cubs' High-A club for the past four seasons, including the previous two with Myrtle Beach. Juan Cabreja, who spent the 2016 campaign as the Pelicans' assistant coach, will work as Short Season Class A Eugene's hitting coach in 2017. The 2017 season will be the 19th season for the Pelicans franchise and third as the Class A-Advanced affiliate of the Chicago Cubs. For information on tickets to see the Pelicans in 2017, please call (843) 918-6000, e-mail info@myrtlebeachpelicans.com, or visit www.MyrtleBeachPelicans.com. ABOUT THE PELICANS: The Myrtle Beach Pelicans are the Class A-Advanced affiliate of the Chicago Cubs and play their home games at TicketReturn.Com Field at Pelicans Ballpark in Myrtle Beach, South Carolina. The park has ranked in the top eight in all of Minor League Baseball by Stadium Journey in each of the last six seasons. The same publication also placed the Pelicans in the Top 100 Stadium Experiences in all of sports in each of the last six years and the best in the Carolina League for six straight seasons as well. In May 2015, TicketReturn.Com Field at Pelicans Ballpark won the 2015 TripAdvisor.com Certificate of Excellence award. The Pelicans are the two-time defending Mills Cup Champions, winning the title in 2015 and 2016 as well as 2000 and co-Mills Cup championship honors in the inaugural 1999 season. The Pelicans have made ten postseason appearances behind 12 half-season Southern Division championships, including the first half of the 2015 season and second half of 2016. For more information on the Myrtle Beach Pelicans, please contact the Pelicans at (843) 918-6000 or emailing Info@MyrtleBeachPelicans.com.